This book aims to help teachers gain theoretical knowledge and to confirm and extend what they already know. It also suggests a variety of practical ideas, skills and activities for the classroom. 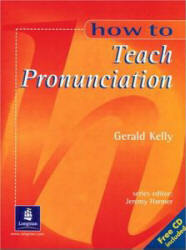 The book shows teachers how to integrate pronunciation work with the treatment of grammar and lexis in order to help students appreciate its relevance and importance for successful communication. • Chapter 1 explores the features and physiology of pronunciation, and introduces phonemic transcription. • Chapter 2 deals with various approaches to teaching pronunciation, and introduces three types of lesson: "Integrated lessons, where pronunciation is fully integrated with the other aspects of the language being taught; Remedial lessons and activities, which deal with pronunciation difficulties and issues which arise in class; and Practice lessons and activities, where particular aspects of pronunciation are addressed in their own right. —theory, factual knowledge and ideas for the classroom. All the chapters except the first one contain a range of sample lessons which demonstrate Integrated, Remedial and Practice lesson types. The Task File at the back of the book comprises a number of tasks relevant to each chapter. They can be used for individual study and reflection, or for discussion and revision in a training context. An answer key is provided where appropriate. The appendices offer a newly designed learners' reference chart of English sounds, a summary of common pronunciation difficulties, a set of sound and spelling tables, and suggestions for further reading. The Compact Disc accompanying the book contains examples of sounds and sentences from the text. The relevant CD track numbers are indicated within the book by the symbol on the left. • What are the main features of pronunciation? • What is word stress? • What is intonation, and why teach it? • How teachable is intonation? • Why 'other' aspects of connected speech? • Should we teach these aspects of connected speech?